A leopard feared by all who live in the jungle, and an enemy of Tarzan and the gorillas. Sabor is a cunning hunter who targets the weak and helpless. 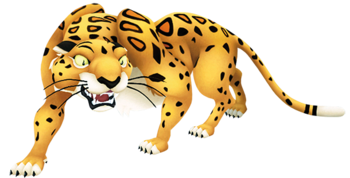 Sabor is a deadly, man-eating leopard who first appeared in Walt Disney's Tarzan and, in Kingdom Hearts, serves as a mini-boss in Deep Jungle. When Sora first arrives in Deep Jungle, he falls into a wooden tree house and is attacked by Sabor. Tarzan rescues the Keyblade wielder from the leopard, who continues to stalk them until he is defeated once and for all. Sabor is a large leopard with a slender, yet muscular build. He has yellow fur; the fur around his mouth, on the bottoms of his paws, on his stomach, and on the tip of his tail is white. Sabor's head and legs have black spots on them, and his back and shoulders sport yellow-orange spots with black outlines. Sabor's eyes are yellow, and he has six long, black whiskers; there are three on each side of his upper lip. Protruding from Sabor's paws are sharp black claws. The only attacks in Sabor's arsenal are a non-elemental tackle and claw swipe. The leopard is extremely fast, as well, making him difficult to attack for extended periods of time. In order to defeat Sabor, Sora should rely primarily on his standard three-hit combo and attack only after the leopard charges at him. Sora should then be sure to Dodge Roll out of the way to avoid being damaged by potential counterattacks; he can also block Sabor's attacks with Guard to earn Tech Points. The outcome of Sora's first battle with Sabor is the same whether he wins or loses. During his final encounter with Sora in the Bamboo Thicket, Sabor jumps out of sight before reappearing in a different part of the battlefield. To avoid being hit by a potential surprise attack, Sora should Lock-On to the leopard just before he vanishes. Throughout this battle, Magic is Sora's best means of damaging Sabor when the leopard is too far away to be hit by physical attacks. It is also important that Sora heal himself regularly to help ensure victory; while Sabor's attacks are not that powerful they can be dangerous when combined with the leopard's agility. Sabor first appeared in Walt Disney's 1999 animated feature, Tarzan. In the beginning of the film, she hunts and kills Kerchak and Kala's young son. She then goes on to murder the infant Tarzan's parents. Before Sabor is able to kill Tarzan as well, Kala comes to the baby's rescue. Many years later, after Tarzan has grown into a man, Sabor attacks him and his gorilla family at their nest. In an effort to protect the other gorillas, Kerchak engages the fearsome leopard in combat, but he is overpowered. Tarzan then joins the fight; he manages to kill Sabor and presents the leopard's corpse to Kerchak in a show of respect. While Sabor is female in the Disney canon, Kingdom Hearts erroneously depicts the leopard as male.